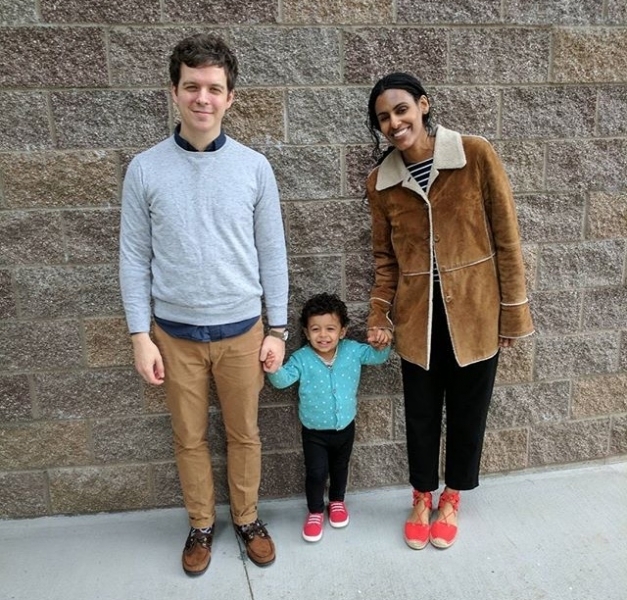 Adoption Profile - Hopeful adoptive parents, Scott and Rahel, wish to adopt a baby. Thank you for being incredibly selfless and searching high and low to give your baby the best life possible. We know that life can be incredibly complicated, confusing and painful- but are grateful and inspired by your strength and knowledge in remembering that there is also so much beauty, goodness, and incredible potential in our world. From the moment Scott and I met, we have constantly strived to provide each other with boundless love and respect. We believe that it is the foundation to our wildest dreams. Those dreams have covered everything from exploring new countries, pursuing further education, growing our careers, building a home we're proud of, making music and writing, to becoming parents. Everything we do is ultimately for our family. We're kind of obsessed with family. We have built our lives around the joy and importance of routinely showering our only child Johannes (Yoni) with unconditional love, compassion, safety, and education. We are surrounded by excellent school, sports, culture, music and arts programs, playgrounds, a popular zoo, popular Seattle landmarks and stunning beaches. We're also grateful to be part of a big family (we each of three sisters and incredible parents that mean the world to us) and live in a neighborhood that is full of multi-racial and multi-cultural families like ourselves. Our biggest dream is to complete our family via adoption. We/re so grateful for Yoni and are counting down the days until we find the good fortune to experience this again. We're very ready to meet the final piece of our little tribe. We promise to be here every day. Ready and able to eagerly and happily provide, nourish and grow our children's minds, bodies and spirits. We want the best for you and your baby and wish you nothing but the utmost success in finding the right future. If you think there's something here and you would like to talk, please don't hesitate to call our cell at 206-717-5778. You can also write to us at rahelandscottadopt@gmail.com. We will be there for your child every minute of every day. We will joyfully and consistently provide unconditional love. We will be relentless and determined to keep your child strong, safe, kind, healthy and wise. We have access to top healthcare and education. We're crazy about dreams. We're going to help your child pursue their wildest hopes and dreams, no matter what it is. Lunch with Grandpa and his Granduncles! We met as co-workers at a marketing agency in Seattle over seven years ago. After six months of friendship and awkward flirting, we went out for margaritas and the the rest is history! We love each other a lot. It's kind of a cheesy thing to declare, but it's true. We've explored different countries together, nurtured our careers and built a home we're proud of. Our love has grown to unimaginable levels since we welcomed our little boy in 2015. He is a joy. Becoming parents has only deepened our bond to each other and makes us so grateful for the life we have. Our daily routines as a family includes eating homemade meals together, playing music, voracious reading and playing outside, rain or shine. Lately, we've been busy growing a backyard vegetable garden, learning everything there is to know about the solar system, playing piano and practicing soccer. We've learned that our passions change with our son's interests, and that exploring his questions and imagination fuels how we want to spend our time. We can't wait to meet the final piece of our family. We know she or he is out there, and are eager to raise her or him with relentless love, strength, wisdom and kindness. Wow- what an eventful couple of months! Our family had been yo-yo-ing between vacations across the country, long weekend trips to visit family and friends across Washington state and gearing up for the holiday season. Our visits over the past couple of months include LA, New York City, Chicago, Spokane, Bellingham, and Scottsdale. Will upload pictures soon! Yoni has been having a blast with preschool- he attends 3x a week and can’t get enough of seeing friends, singing songs about alphabet and numbers, writing and field trips around Seattle. Scott has been taking more time off from work to be at home with me and Yoni. We enjoyed a long Thanksgiving weekend eating turkey with family, re-arranging the house for Christmas season, took long walks around the neighborhood and visited our local library, bookstore, playgrounds, and toy shop. On a totally different note- how on earth are there SO MANY TOYS?! Yoni’s eyes were big and glazed from complete joy and disbelief, hah. I’ve been charged with hosting Christmas dinner for 12 this year, and am determined to make it really fun. This means a ton of food, mulled wine, cookie, my dear aunt’s special himbasha (Eritrean sweetbread) and croquembouche. I’m also thinking of sending off each guest with a mason jar of homemade jam or cranberry sauce. See? I am already getting ahead of myself, hah. To me, the holidays have become less and less about material things and the gift of presence and togetherness. Celebrating what we have (each other) and remembering and honoring how that came to be. I never got into the “Christmas spirit” until I became a mother- it’s the role that has given me the most to be grateful for and to celebrate. It’s the gift I will always cherish the most. This summer is winding down and I can’t believe how quickly this season passed! The last month has been jam-packed with daily adventures that have been priceless. We kicked off August with a trip to Portland to visit a friend’s family farm. Although I consider myself a city girl through and through, I found myself loving life on the farm. Of course, my emotions are completely tied to the fact that our 3-year-old had a blast. He fed a llama and sheep, went for long walks down a freshly dug hiking path, swung and climbed on a massive private playset overlooking the Oregon hills and gorge, made friends with new littles and one big dog, picked fresh chicken eggs and got to sleep in a massive bed with Mom and Dad. On the way back to Seattle, we visited Mt. St. Helens, the site of the 1980 volcanic eruption. Yoni was just in heaven. He’s been obsessed with volcanos, so to be in close proximity to one was just mind-boggling to him. It was adorable, fun and well worth the six-hour drive. We also have been swimming non-stop- I was determined to fulfill Yoni’s wish of “getting wet every day”. Summer on a toddler’s schedule is actually super fun. It means a lot of splash parks with friends, pools, burgers, open fields, library visits, naps, backyard gardening with dinner, museums, random walks and a couple pairs of lost sunglasses. We’ve also been graced by a ton of family visits- Scott’s parents came out to visit and treated us to dinner and ice cream, my Mom came out for almost a week and taught us how to cook up some delicious Eritrean recipes, and had dear friends from Chicago, D.C., and Portland stay with us. What else is going on? Scott is killing it at work, I’m working on a children’s book with a super cool friend, we’re stepping up our workout regimen (I tried a cycling class the other day and it *still* hurts to breathe), Yoni is gearing up for his first music lessons this fall, we’re headed to NYC again for our dear friends’ wedding and to visit my sister. Scott is taking the week off to savor the last days of Summer as a family at home. We watched Yoni graduate from his summer soccer camp with utter joy, getting ready for a family road trip to Finn River Cidery in Port Townsend, WA. We’re also going to take advantage of our time together to clean out the garage (oh, the joy) and get the spare bedroom primed and ready for our future little babe. I know it sounds strange planning, organizing, designing and shopping for someone you don’t know will ever come. It’s alright, though. Whenever, if ever, it happens, we’ll be ready, mindfully awake, arms open and hearts overjoyed.